The Grammy Award for Best Female R&B Vocal Performance (previously called Best Rhythm and Blues Solo Vocal Performance, Female) was an honor presented at the Grammy Awards, a ceremony established in 1958 and originally called the Gramophone Awards, to female recording artists for quality R&B songs. Awards in several categories are distributed annually by the National Academy of Recording Arts and Sciences of the United States to "honor artistic achievement, technical proficiency and overall excellence in the recording industry, without regard to album sales or chart position." According to the category description guide for the 52nd Grammy Awards, the award was presented to artists that performed "newly recorded solo R&B vocal performances". Solo numbers by members of an established group were not eligible for the award as "separate entries from the duo or group performances." Albums were also considered for the accolade until 1992. As a part of the major overhaul of Grammy categories, the award was discontinued in 2011. The Female R&B Vocal Performance category, Male R&B Vocal Performance category and all duo/group vocal performances in the R&B category shifted to the Best R&B Performance category in 2012. The award for the Best Female R&B Vocal Performance was first presented to Aretha Franklin at the 10th Grammy Awards ceremony in 1968 for the song "Respect". Franklin received the most wins with eleven, followed by Anita Baker with five. Franklin also holds the record for the most nominations with twenty-three, while Chaka Khan is second with eight nominations. Fantasia Barrino became the final recipient of the award, when her song "Bittersweet" won the award in 2011. The award was presented to artists from the United States each year. Aretha Franklin was the first recipient of the award in 1968. In total, she has won the award eleven times, making her the artist with the most wins in the category. In 1976, Natalie Cole won the award for her song "This Will Be", only the second artist to win the award back then. Thelma Houston became the third artist to win the award, in 1978. Chaka Khan won the award in 1984 for her album Chaka Khan as well as in 1985 and 1993. Anita Baker won the award first in 1987. In total, she has won the award five times, making her the artist with second most wins. Janet Jackson was nominated six times in the category, but did not win. Four-time award winner, Alicia Keys. Keys first won the award in 2002 for her song "Fallin'". Toni Braxton has won the award four times since her debut in 1993. Whitney Houston's song "It's Not Right but It's Okay" won her the award in 2000, making her the first winner of the millennium. Beyoncé Knowles' songs "Dangerously in Love 2" and "Single Ladies (Put a Ring on It)" won her the awards in 2004 and 2010, respectively. Mariah Carey's chart topper "We Belong Together" won the award in 2006. Seven-time nominee, including two-time award winner Mary J. Blige. 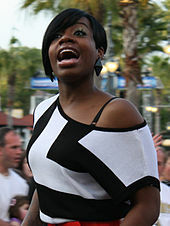 Fantasia Barrino became the last winner in the category, in 2011. She won the award for her song "Bittersweet". Etta James – "Tell Mama"
Gladys Knight – "I Heard It Through the Grapevine"
Nina Simone – "You'll Go to Hell"
Carla Thomas – "The Queen Alone"
Barbara Acklin – "Love Makes a Woman"
Erma Franklin – "Piece of My Heart"
Ella Washington – "He Called Me Baby"
Aretha Franklin "Share Your Love with Me"
Gloria Taylor – "You Gotta Pay the Price"
Tina Turner – "The Hunter"
Dee Dee Warwick – "Foolish Fool"
Aretha Franklin "Don't Play That Song"
Esther Phillips – "Set Me Free"
Candi Staton – "Stand by Your Man"
Dee Dee Warwick – "She Didn't Know"
Jean Knight – "Mr. Big Stuff"
Diana Ross – "(I Love You) Call Me"
Merry Clayton – "Oh No Not My Baby"
Esther Phillips – "From a Whisper to a Scream"
Candi Staton – "In the Ghetto"
Betty Wright – "Clean Up Woman"
Aretha Franklin "Master of Eyes (The Deepness of Your Eyes)"
Ann Peebles – "I Can't Stand the Rain"
Esther Phillips – "Alone Again (Naturally)"
Aretha Franklin "Ain't Nothing Like the Real Thing"
Shirley Brown – "Woman to Woman"
Thelma Houston – "You've Been Doing Wrong for So Long"
Millie Jackson – "(If Loving You Is Wrong) I Don't Want to Be Right"
Etta James – "St. Louis Blues"
Ann Peebles – "You Keep Me Hangin' On"
Tina Turner – Tina Turns the Country On! Natalie Cole "This Will Be"
Gloria Gaynor – "Never Can Say Goodbye"
Gwen McCrae – "Rockin' Chair"
Esther Phillips – "What a Diff'rence a Day Makes"
Shirley & Company – "Shame, Shame, Shame"
Natalie Cole "Sophisticated Lady (She's a Different Lady)"
Aretha Franklin – "Something He Can Feel"
Dorothy Moore – "Misty Blue"
Melba Moore – "Lean On Me"
Diana Ross – "Love Hangover"
Natalie Cole – "I've Got Love on My Mind"
Aretha Franklin – "Break It to Me Gently"
Dorothy Moore – "I Believe You"
Diana Ross – "Your Love Is So Good for Me"
Alicia Bridges – "I Love the Nightlife"
Natalie Cole – "Our Love"
Amii Stewart – "Knock on Wood"
Donna Summer – "Bad Girls"
Aretha Franklin – "I Can't Turn You Loose"
Diana Ross – "Upside Down"
Aretha Franklin "Hold On! I'm Comin'"
Jennifer Holliday "And I Am Telling You I'm Not Going"
Aretha Franklin – "Jump to It"
Patrice Rushen – "Forget Me Nots"
Donna Summer – "Love Is in Control (Finger on the Trigger)"
Deniece Williams – "It's Gonna Take a Miracle"
Patti LaBelle – "The Best Is Yet to Come"
Tina Turner – "Let's Stay Together"
Deniece Williams – "Let's Hear It for the Boy"
Whitney Houston – "You Give Good Love"
Patti LaBelle – "New Attitude"
Aretha Franklin – "Jumpin' Jack Flash"
Whitney Houston – "For the Love of You"
Jody Watley – "Looking for a New Love"
Taylor Dayne – "I'll Always Love You"
Karyn White – "The Way You Love Me"
Vanessa Williams – "The Right Stuff"
Janet Jackson – "Miss You Much"
Regina Belle – "Make It Like It Was"
Patti LaBelle – "I Can't Complain"
Pebbles – "Giving You the Benefit"
Patti LaBelle "How Can I Ease the Pain"
Vanessa Williams – "Running Back to You"
Oleta Adams – "Don't Let the Sun Go Down on Me"
Whitney Houston – "I Belong to You"
Shanice – "I Love Your Smile"
Vanessa Williams – "The Comfort Zone"
Aretha Franklin – "Someday We'll All Be Free"
Whitney Houston – "I'm Every Woman"
Janet Jackson – "That's The Way Love Goes"
Patti LaBelle – "All Right Now"
Anita Baker – "Body And Soul"
Aretha Franklin – "A Deeper Love"
Gladys Knight – "I Don't Want to Know"
Meshell Ndegeocello – "If That's Your Boyfriend (He Wasn't Last Night)"
Toni Braxton – "I Belong To You"
Mariah Carey – "Always Be My Baby"
Vanessa Williams – "The Way That You Love"
Toni Braxton "You're Makin' Me High"
Mary J. Blige – "Not Gon' Cry"
Tamia – "You Put a Move on My Heart"
Whitney Houston – "Exhale (Shoop Shoop)"
Patti LaBelle – "When You Talk About Love"
Whitney Houston – "I Believe in You and Me"
Aaliyah – "Are You That Somebody?" Aretha Franklin – "A Rose Is Still a Rose"
Janet Jackson – "I Get Lonely"
Whitney Houston "It's Not Right but It's Okay"
Brandy – "Almost Doesn't Count"
Mary J. Blige – "All That I Can Say"
Macy Gray – "Do Something"
Toni Braxton "He Wasn't Man Enough"
Erykah Badu – "Bag Lady"
Kelly Price – "As We Lay"
Jill Scott – "Gettin' in the Way"
Jill Scott – "A Long Walk"
Mary J. Blige "He Think I Don't Know"
Aaliyah – "More Than a Woman"
Eartha – "I'm Still Standing"
Jill Scott – "He Loves Me (Lyzel in E Flat)"
Beyoncé Knowles "Dangerously in Love 2"
Ashanti – "Rain on Me"
Erykah Badu – "Back in the Day"
Mary J. Blige – "Ooh!" Heather Headley – "I Wish I Wasn't"
Janet Jackson – "I Want You"
Teena Marie – "I'm Still in Love"
Beyoncé – "Wishing on a Star"
India.Arie – "I Am Not My Hair"
Natalie Cole – "Day Dreaming"
Mariah Carey – "Don't Forget About Us"
Fantasia – "When I See U"
Chrisette Michele – "If I Have My Way"
Jill Scott – "Hate On Me"
Beyoncé – "Me, Myself and I (Live)"
Keyshia Cole – "Heaven Sent"
Jazmine Sullivan – "Need U Bad"
Melanie Fiona – "It Kills Me"
Lalah Hathaway – "That Was Then"
Ledisi – "Goin' Thru Changes"
Jazmine Sullivan – "Lions, Tigers & Bears"
Faith Evans – "Gone Already"
Monica – "Everything to Me"
Jazmine Sullivan – "Holding You Down (Goin' in Circles)"
"Past Winners Search". National Academy of Recording Arts and Sciences. Retrieved 2011-10-19. Note: User must select the "R&B" category as the genre under the search feature. ^ "Grammy Awards at a Glance". Los Angeles Times. Tribune Company. Retrieved 2011-10-18. ^ "Overview". National Academy of Recording Arts and Sciences. Retrieved 2011-10-18. ^ "52nd OEP Category Description Guide" (PDF). National Academy of Recording Arts and Sciences. p. 3. Archived from the original (PDF) on 2009-10-27. Retrieved 2011-10-18. ^ "Awards Category Comparison Chart" (PDF). National Academy of Recording Arts and Sciences. p. 1. Retrieved 2011-10-18. ^ "1967 Grammy Awards Finalists". Billboard. Nielsen Business Media, Inc. 80 (7): 10. 1968-02-17. ISSN 0006-2510. Retrieved 2011-07-02. ^ a b c O' Neil, Thomas (1993). The Grammys. New York: Perigee Books. p. 714. ISBN 0-399-52477-0. ^ "Blood, Sweat and Tears Tops Grammy Nominations". Los Angeles Times. Tribune Company. 1970-02-09. p. C24. ^ "Grammy Award Final Nominations". Billboard. Nielsen Business Media, Inc. 83 (6): 12. 1971-02-06. ISSN 0006-2510. Retrieved 2011-07-03. ^ "Grammy Award Final Nominations". Billboard. Nielsen Business Media, Inc. 84 (6): 12. 1972-02-05. ISSN 0006-2510. Retrieved 2011-07-03. ^ Hilburn, Robert (1974-01-18). "Grammy Nominee List Headed by Stevie Wonder". Los Angeles Times. Tribune Company. p. E1. ^ "19th Annual Grammy Awards Final Nominations". Billboard. Nielsen Business Media, Inc. 89 (3): 110. 1977-01-22. ISSN 0006-2510. Retrieved 2011-07-04. ^ "20th Annual Grammy Awards Final Nominations". Billboard. Nielsen Business Media, Inc. 90 (3): 17. 1978-01-21. ISSN 0006-2510. Retrieved 2011-07-04. ^ "21st Annual Grammy Awards Final Nominations". Billboard. Nielsen Business Media, Inc. 91 (3): 122. 1979-01-20. ISSN 0006-2510. Retrieved 2011-07-04. ^ Santosuosso, Ernie (1980-02-24). "Pickin' Hits for Grammies". The Boston Globe. The New York Times Company. p. 1. ^ "Here's complete list of the Grammy nominees". The Register-Guard. Guard Publishing Co. 1981-02-21. p. 38. Retrieved 2011-08-30. ^ "24th Annual Grammy Awards Final Nominations". Billboard. Nielsen Business Media, Inc. 94 (3): 90. 1982-01-23. ISSN 0006-2510. Retrieved 2011-08-30. ^ "25th Annual Grammy Awards Final Nominations". Billboard. Nielsen Business Media, Inc. 95 (3): 67. 1983-01-22. ISSN 0006-2510. Retrieved 2011-08-30. ^ "Complete List of the Nominees for 26th Annual Grammy Music Awards". Schenectady Gazette. The Daily Gazette Company. 1984-01-09. p. 12. Retrieved 2011-10-18. ^ "27th Annual Grammy Awards Final Nominations". Billboard. Nielsen Business Media, Inc. 97 (4): 78. 1985-01-26. ISSN 0006-2510. Retrieved 2011-10-18. ^ "27th Annual Grammy Awards Final Nominations". Billboard. Nielsen Business Media, Inc. 98 (4): 78. 1986-01-26. ISSN 0006-2510. Retrieved 2011-10-18. ^ Hunt, Dennis (1987-01-09). "Grammy Nominations: Highs and Lows: Winwood, Gabriel and Simon Garner Most Nominations". Los Angeles Times. Tribune Company. p. 2. Retrieved 2011-10-18. ^ Hunt, Dennis (1988-01-15). "U2, Jackson Top Grammy Nominees: Simon, Winwood Seek Reprise of '87 Wins". Los Angeles Times. Tribune Company. p. 2. Retrieved 2011-10-18. ^ "Chapman Gets 6 Grammy nominations, McFerrin 5". Toledo Blade. Block Communications. 1989-01-13. p. P-2. Retrieved 2011-10-18. ^ Silverman, David (1990-01-12). "Grammy Nominations Break With Tradition". Chicago Tribune. Tribune Company. Retrieved 2011-10-18. ^ "Jones, Hammer, Jackson Top Grammy Nominees". Jet. Johnson Publishing Company. 79 (15): 56. 1991-01-28. ISSN 0021-5996. Retrieved 2011-10-18. ^ "Grammy Nominations 1992". Los Angeles Times. Tribune Company. 1992-01-09. p. 2. Retrieved 2011-10-18. ^ "35th Grammy Nominees". Los Angeles Times. Tribune Company. 1993-01-08. p. 2. Retrieved 2011-10-18. ^ "36th Annual Grammy Awards Final Nominations". Billboard. Nielsen Business Media, Inc. 106 (3): 66. 1994-01-15. ISSN 0006-2510. Retrieved 2011-10-18. ^ "37th Annual Grammy Awards: Final Nominations". Billboard. Nielsen Business Media, Inc. 107 (2): 66. 1995-01-14. ISSN 0006-2510. Retrieved 2011-10-18. ^ "38th Annual Grammmy Awards: Final Nominations". Billboard. Nielsen Business Media, Inc. 107 (2): 73. 1996-01-13. ISSN 0006-2510. Retrieved 2011-10-18. ^ "39th Annual Grammy Awards: Final Nominations". Billboard. Nielsen Business Media, Inc. 109 (3): 84. 1997-01-18. ISSN 0006-2510. Retrieved 2011-10-18. ^ "40th Annual Grammy Awards: Final Nominations". Billboard. Nielsen Business Media, Inc. 110 (3): 78. 1998-01-17. ISSN 0006-2510. Retrieved 2011-10-18. ^ "Final Nominations for the 41st Annual Grammy Awards". Billboard. Nielsen Business Media, Inc. 111 (3): 80. 1999-01-16. ISSN 0006-2510. Retrieved 2011-10-18. ^ "Final Nominations for the 42nd Annual Grammy Awards". Billboard. Nielsen Business Media, Inc. 112 (3): 72. 2000-01-15. ISSN 0006-2510. Retrieved 2011-10-18. ^ "43rd Grammy Awards". CNN. 2001-02-21. Retrieved 2011-10-18. ^ "Final Nominations for the 44th Annual Grammy Awards". Billboard. Nielsen Business Media, Inc. 114 (3): 90. 2002-01-19. ISSN 0006-2510. Retrieved 2011-10-18. ^ "Complete Nominations for 45th Annual Grammy Awards". Billboard. Nielsen Business Media, Inc. 115 (3): 86. 2003-01-18. ISSN 0006-2510. Retrieved 2011-10-18. ^ Associated Press (2003-12-05). "Complete list of Grammy Award nominations". Deseret News. Deseret News Publishing Company. p. 2. Retrieved 2011-10-18. ^ "Grammy Award nominees in top categories". USA Today. Gannett Company Inc. 2004-12-07. Retrieved 2011-10-18. ^ The Associated Press (2005-12-08). "Complete list of Grammy Award nominations". USA Today. Gannett Company Inc. Retrieved 2011-10-18. ^ "Complete list of Grammy nominees". San Francisco Chronicle. Hearst Corporation. 2006-12-08. p. 3. Retrieved 2011-10-18. ^ "The Complete List of Grammy Nominees". The New York Times. The New York Times Company. 2007-12-06. Retrieved 2011-10-18. ^ Conner, Thomas (2008-12-03). "Complete list of Grammy nominees". Chicago Sun-Times. Sun-Times Media Group. Archived from the original on 2015-02-08. Retrieved 2011-10-18. ^ Lustig, Jay (2009-12-02). "Nominees List for 2010 Grammys". The Star-Ledger. Advance Publications. Retrieved 2011-10-18. ^ "Grammy Awards 2011: Winners and Nominees for 53rd Grammy Awards". Los Angeles Times. Tribune Company. 2011-02-15. Retrieved 2011-10-18.